Coed team hunting is hard. Usually the man tries to set up the lady for success. Ladies First, is how a gentleman hunter mentors his partner. If you are dating and things go south, you can always find a new partner. If you are married, things can be rough. At least the Hunting Dating Game is a test that will determine if you want to commit to marriage. Recently a hunting friend named Brian Roland took his girlfriend for an elk hunt near Whitehall. She had experience from previous hunts and Brian set her up for success. 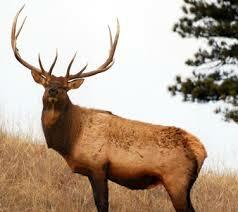 They located a group of elk on the edge of trees and put on the sneak. Once in decent range, they set up for the shot at a good bull. Ladies First! Brian’s partner rested the rifle and set up for the shot, but this is an incredibly exciting moment. Brian also set up on the bull as backup. Two shots rang out and the bull was untouched and on the move. She had missed, and it was Brian’s turn. One shot later the bull was down. Brian’s girlfriend was upset that she had missed and jealous that he didn’t. This of course is normal reaction and human nature. Carrying out someone else’s bull is never as much fun as hauling your own. Should Brian have let her take a third shot? Should he have shot at all? With this hunting partnership survive? These are questions that will need to be considered. The good news is that at the end of the day, a hunting team hauled out a great bull together. Well done team! Also know that there is more to learn from a miss or mistake than filling a tag. Make this a teaching moment so that next time you can be on target. Practice makes perfect, tomorrow is another day, and great hunting partners are tough to find. Sharing these special moments is always the best part of a relationship! For more Montana Grant, sneak up on him at www.montanagrantfishing.com.